Do you ever have those weeks where you just run out of ideas for dinner? Have no fear - I have put together my Weekly Menu full of clean and healthy dinner ideas! 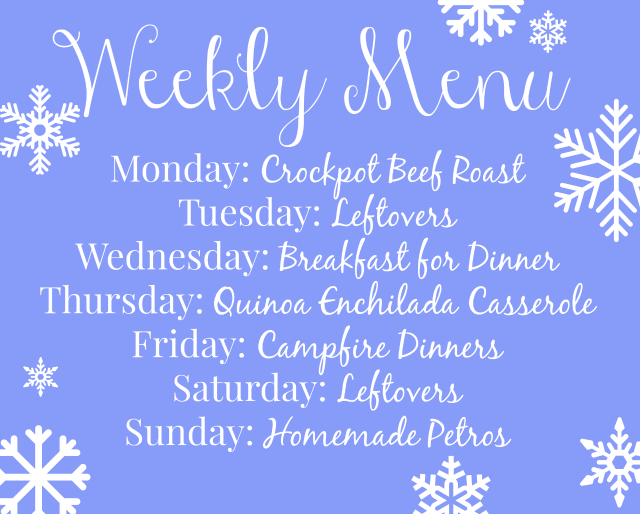 Check out the recipes on this week's menu! Crockpot Beef Roast - No recipe! I simply put a beef roast in my crockpot! You could top it with some onion soup mix - it's easy to avoid your own to be sure to avoid MSG! I'll serve it with salad and maybe a sweet potato. Breakfast for Dinner - This is the perfect dinner when we are in a hurry or have something planned for that night. I will probably make egg sandwiches. I simply stuff 2 fried eggs, 2 strips of turkey bacon, and sliced cheddar cheese in a whole wheat pita pocket. My husband LOVE it! He claims he'd eat it every night. Quinoa Enchilada Casserole - Who doesn't love taco night? My friend Amy started making this casserole and it is fantastic! I love it by itself and hubby likes to wrap his portion inside a whole wheat tortilla. Campfire Dinners - I know I have this on a previous menu - but I can't help it! I love them and they are so easy. This is going to be a really busy week in our house, so I need quick and easy! Homemade Petros - Superbowl Sunday! You can have your own homemade Petros. Homemade chili, sour cream or greek yogurt, and shredded cheddar. Add some of your other favorite toppings, too. If you need the corn chips, too - try Trader Joe's Organic Corn Chip Dippers. These were Food Babe approved! 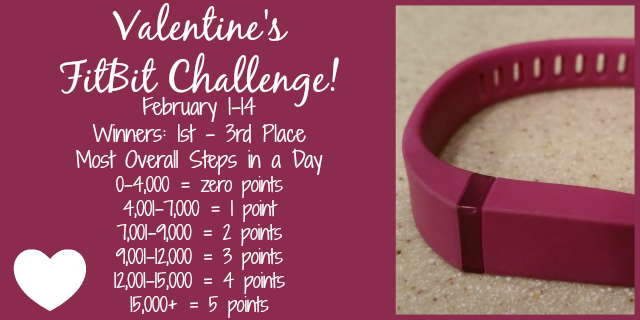 I loved competing in a FitBit challenge. It really motivated me to get moving, so I am hosting my own! It is starting February 1st and will run for 2 weeks. I already have a group of 15 fabulous ladies who are excited to get started! It is going to be a great two weeks of being active and encouraging one another.